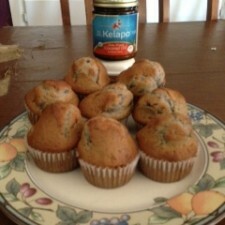 When I was younger, my mom always made the best blueberry muffins. There was nothing better than waking up on Saturday mornings to the smell of blueberry muffins baking in the oven. The past few mornings all I have been able to think about, as I roll out of bed, is how bad I want some stinking blueberry muffins! The craving was too much to bear, so last night I went out and got everything that I needed to make myself some muffins. I was so excited that I couldn’t even wait until the morning! I went straight to the kitchen, preheated the oven to 400° and got to work mixing the ingredients. Instead of using the cooking oil that the recipe called for, I substituted coconut oil. The muffins turned out great! I have made these muffins a few other times without using coconut oil but I was pleasantly surprised by the flavor and moisture that the coconut oil added. The coconut oil didn’t add any sweetness or coconut flavor to my dish but, I did notice a difference in the taste of the muffins. It was as if the coconut oil helped to bring the distinct flavors of the dough and blueberries to the surface instead of washing them together; as regular oils sometimes do. These muffins turned out great! What are some grab and go breakfast foods you like to make with coconut oil?